Recommendation of ancient documents and holy scriptures of Daigoji Temple as national treasures. Ancient documents and holy scriptures have been preserved in our archives ever since the head priest, Gien Zasu, began preserving documents in the Momoyama period, in boxes, which the temple had possessed since the Heian period. In 1902, a researcher of the Historiographical Institute of the Tokyo Imperial University, Prof. Katsumi Kuroita, counted 658 of those boxes, and came to the conclusion that the contents were of invaluable historical importance to Japanese history. These documents not only included historical materials on Buddhism, but also on matters related to politics, the economy, and the arts, and concluded that further research of the materials should be carried out　and initiated a full-scale research in 1914. 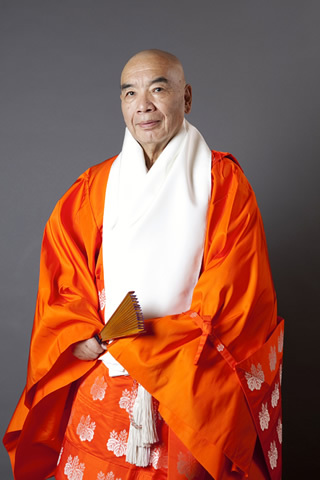 The research started by Prof. Katsumi Kuroita continued for a hundred years, and the "ancient documents and holy scriptures of Daigoji Temple catalogue" is being produced, and since 1902, an effort has been made to create a computerized database of the documents to make them more readily accessible since 1985. As a result of the effort, on all parts, the documents preserved in the boxes have now been designated as cultural treasures, and this time, 69,378 items from the boxes, numbered from 1 to 558, have been listed as "national treasures" as "ancient documents and holy scriptures of Daigoji Temple." I feel great pride in the fact that I have been able to live up to "the scholastic virtues and expectations" of Prof. Katsumi Kuroita and others who had been involved in the research since 1898, and I would also like to express my deepest appreciation to successive Zasu's (head priest) and the many other priests at the temple who provided their support for the research. We do not intend to keep these historical documents isolated within the temple, but wish to continue our efforts to repair each and every document, and create a catalogue and index of the documents utilizing digital imaging technology. I am confident that because of the aforementioned efforts, these cultural treasures will find a place alongside other items of cultural importance from academic societies the world over. Whilst the basic preparations for this endeavor have been carried out, we believe the establishment of "Archives Library," just like a library, is necessary. We will continue to further our work on the remaining 270 boxes of documents, and add them to what have already been designated as national treasures as our responsibility to carry on the tradition of "paper culture." Copyright © 2013 Daigoji Cultural assets Archives All Rights Reserved.